Nobel Peace Prize-winner Malala Yousafzai Friday urged Japan and its fellow Group of 20 nations to pledge new funding for educating girls at June's G20 summit, hosted by the Japanese. 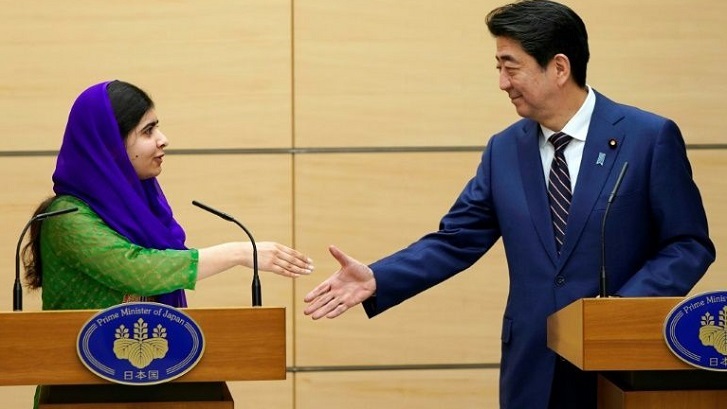 Speaking alongside Shinzo Abe, the celebrated Pakistani education activist told Japan's Prime Minister about "the importance of investing in girls now for future economic growth and global stability." "As the chair of this year's G20, I hope Prime Minister Abe in Japan will lead on girls' education and encourage all leaders to commit to new funding to prepare girls for the future of work," she told reporters. "I hope he can use his G20 presidency to help my sisters in Japan, G20 countries and around the world to reach their full potential because the world works better when girls go to school." Malala became a global symbol for girls' education and human rights after a gunman boarded her school bus in October 2012, asked "Who is Malala?" and shot her.